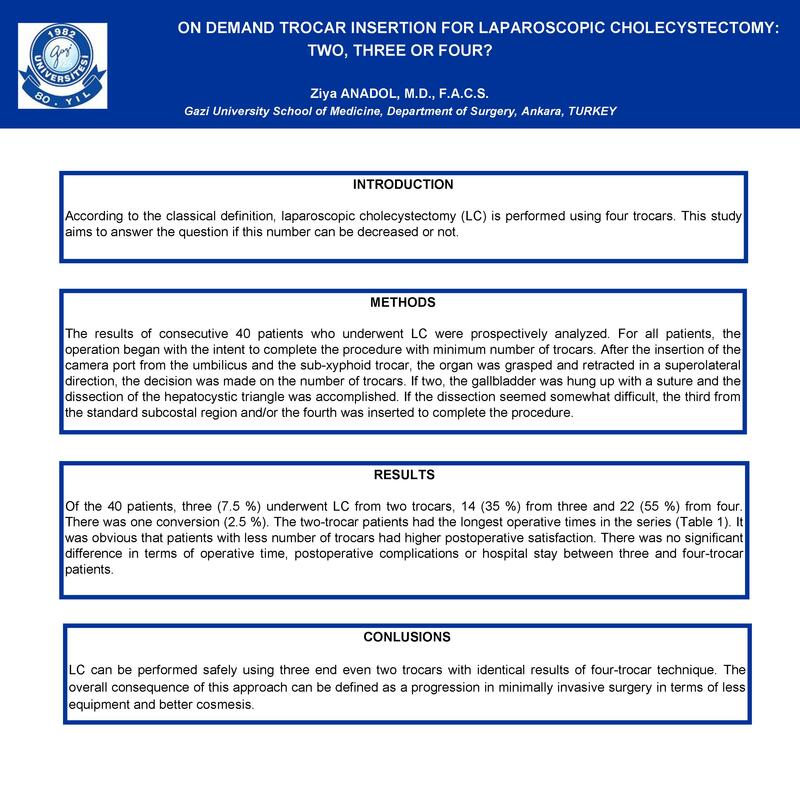 On Demand Trocar Insertion for Laparoscopic Cholecystectomy: Two, Three or Four? According to the classical definition, laparoscopic cholecystectomy (LC) is performed using four trocars. This study aims to answer the question if this number can be decreased or not. The results of consecutive 40 patients who underwent LC were prospectively analyzed. For all patients, the operation began with the intent to complete the procedure with minimum number of trocars. After the insertion of the camera port from the umbilicus and the sub-xyphoid trocar, the organ was grasped and retracted in a superolateral direction, the decision was made on the number of trocars. If two, the gallbladder was hung up with a suture and the dissection of the hepatocystic triangle was accomplished. If the dissection seemed somewhat difficult, the third from the standard subcostal region and/or the fourth was inserted to complete the procedure. Of the 40 patients, three (7.5 %) underwent LC from two trocars, 14 (35 %) from three and 22 (55 %) from four. There was one conversion (2.5 %). The two-trocar patients had the longest operative times in the series (Table 1). It was obvious that patients with less number of trocars had higher postoperative satisfaction. There was no significant difference in terms of operative time, postoperative complications or hospital stay between three and four-trocar patients. LC can be performed safely using three end even two trocars with identical results of four-trocar technique. The overall consequence of this approach can be defined as a progression in minimally invasive surgery in terms of less equipment and better cosmesis.